I have talked to a few Exchange Server admins that need a shared calendar or even a shared Outlook contact folder and also have data accessible from iPhones. Maybe they have 10 or 15 users with iPhones and iPads. There is a quick and dirty solution that will work as long as you don't get carried away and try to add too many smartphone users. If you need an Enterprise grade solution, read this blog post to sync a public folder calendar to many smartphones. If you are on Office 365, CiraSync Personal Edition is free. The approach is is to create a shared mailbox that has a shared contact and shared calendar folder. You will need to move all of the required Outlook contacts and calendars items to this mailbox using an Outlook Desktop. For the purpose of this example, lets assume that the email address is GrpMbx@widgetcorp.com. Next, you will need to personally get each iPhone in your hand to configure the iOS settings. However, start with our own iPhone first. Even if you are not one of the primary users of the shared mailbox, you probably need to support these users so start with your phone. From the Settings screen, choose Mail Contacts and Calendar. 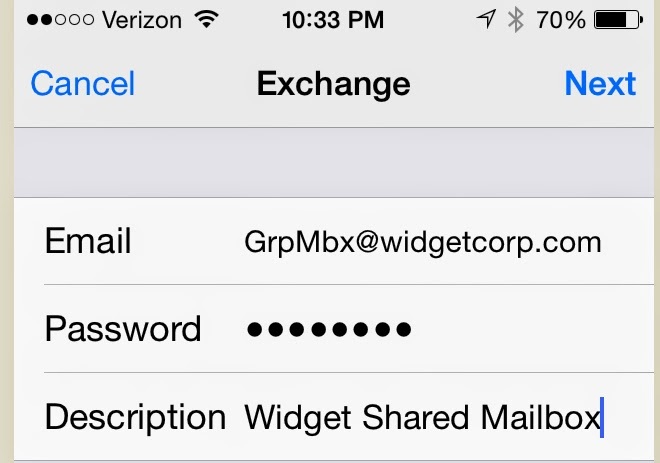 Add a secondary Account for the Exchange mail server using the shared mailbox credentials. When you setup the account, don't use the default Description "Exchange" - instead use a name that is easy to identify. For example, "Widget Shared Mailbox" will be seen by each user when they select contacts, or a calendar. In the example below, note the red arrows. 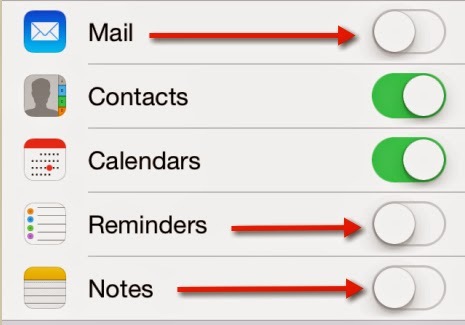 We turn off iOS sync for Mail, Reminders and Notes. I recommend you keep this as simple as possible to start off with and sync exactly what you need. I recommend you do this configuration yourself for every single user. If you give out these instructions and the password to all users, it will become public knowledge. Even employees that are not suppose to use the shared mailbox will know the password. Keeping the password close to the vest avoids many possible security breaches. Murphy's Law guarantees this will always happen at the worst possible time for your business operations. If several users are in a remote office, find one trustworthy individual that you can share the password with. Once this is setup for your users, they can select the shared calendar, make changes to it and do the same for the shared contacts. This is a pretty awesome capability, but at the same time, it does not scale to large numbers of users. There is first the maintenance and support aspect of having two or three dozen iPhones connecting to a single mailbox. Especially when one person has to personally configure these devices. There may also be a throttling issue with the Exchange Server. For example with Office 365 and Exchange 2013, you can't even change the throttling. Exceeding the limits may mean lost sync with calendar or contact items. If you want to try a more scalable Enterprise Solution, please see my recent blog post on how to sync a public folder contacts to an iPhone. Even though this article talks about public folders as a sync source, you can just as easily use contacts in a shared mailbox.